Happy holiday Monday to all Canadian Team Stryker fans! Sorry for the very late update. I didn’t have my computer with me at work today and therefore couldn’t update in between customers. Today marks a very special day in Team Stryker history. 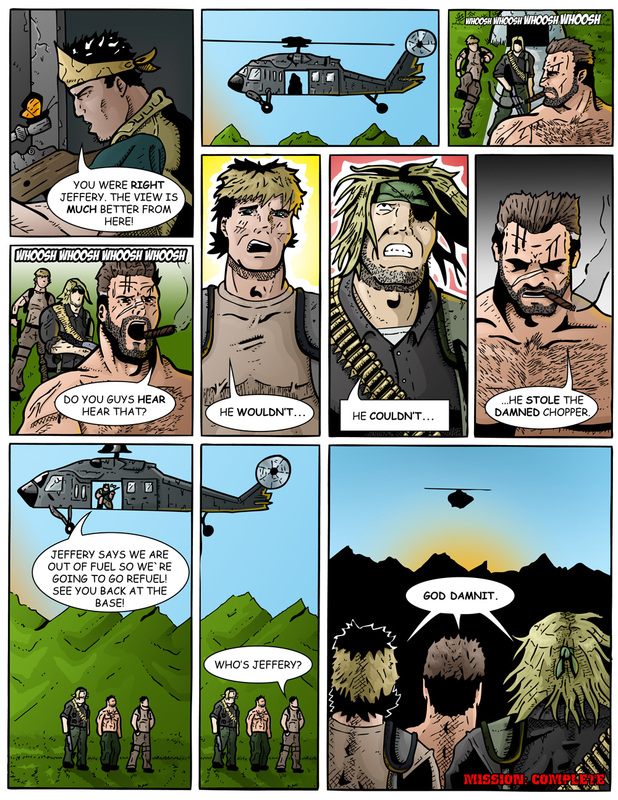 Today marks the end of Team Stryker Mission 001! *waits for applause* Thank you, thank you, you are all too kind. Its been a long time coming but I have never been more excited for Team Stryker as I am today. This comic has been my hobby for the last 4 years and to have it online for the world to see and hopefully embrace is an amazing feeling. If I can make one person’s day a little brighter after they read Team Stryker it will have all be worth it. There are many exciting things on the horizon for TS and I can’t wait to share them with the world starting with the first issue of Team Stryker is officially for sale online in its completed form! You can find the link to page here or go straight to the online publisher here. There will also be a downloadable version available very shortly so stay tuned! Now that Mission 001 is done we can look to the future with Mission 002! With issue 2 I wanted to try to out do myself in every way possible following issue 1. I wanted it bigger, longer and with a more fleshed out villain. While Flaming Swallow is very near and dear to my heart I just didn’t the time to use him to his full potential. I have big plans for FS in the future so keep an eye out for him. Mission 002 comes in at 25 pages plus a cover and I will be updating this site regularly with pages every Monday and Thursday starting this Thursday (July 5,2012) with the cover. From there it will be new pages for the next 13 weeks and once Mission 002 is completed on the site it will be made available for purchase in print as well as digitally. By then there will also be a ton of new items on the official Team Stryker store so keep an eye out for that. Enjoy the rest of your Monday and I will see you all back here for the unveiling of the Team Stryker Mission 002 cover on Thursday.